For dry rot to occur the timber needs to have at least 20% moisture content, but it cannot survive in very wet wood. It likes dark, humid areas and will therefore usually not be visible externally. Of the two types of rot mentioned above this is the more serious as once established it can spread to timber with a lower moisture content, (down to a minimum of 14%), as a result it can be very difficult to eradicate. In fact its fungal roots are able to seek out wood by travelling through mortar and brickwork to infect new areas. Dry rot can grow at a maximum rate of up to 4 meters per year but a more typical growth rate would be 1 meter per year. Affected wood will be lightweight and darkened with large cracks and with no skin of sound timber. The fruiting body of the fungus will usually be located inside the building and will be a white, yellow or red coloured fleshy pancake. The fungal roots will be thin and grey or white. Wet rot occurs in wet timber with moisture content above 40%. It therefore will usually occur near a water leak of some sort. It is less dangerous as it will not spread beyond the wet area and usually simply drying out the area will kill it. Affected wood will be darkened with small cracks and there usually is a skin of sound timber on the face of the affected wood. The fruiting body will usually be a greenish brown pancake shaped. The fungal roots, if present, will be yellow or dark brown. 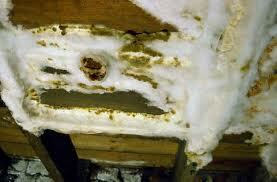 During my career I have encountered many instances of wet and dry rot in buildings which were being renovated. In these cases I recommended that the services of a specialist timber treatment company by engaged to survey the building and then remove and/or treat the rot. It is important to engage specialists as in the case of dry rot, if it is not dealt with conclusively it could reappear afterwards with expensive consequences.